Marshmallow Fluff, peanut butter, bread — what’s not to love about a Fluffernutter? And on October 8, you can eat as many as you’d like thanks to National Fluffernutter Day. 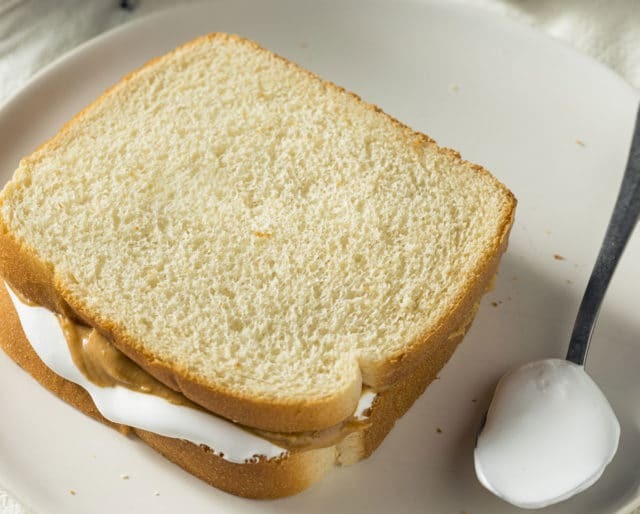 Initially, the term “Fluffernutter” was coined as a way for the marshmallow spread manufacturing company, Durkee-Mower Inc., to market a sandwich that featured Fluff. Now, it’s a national holiday. So celebrate National Flutternutter Day by eating it in sandwich, cookie, cupcake, or candy form — we promise not to judge how you get your Fluffernutter intake. ​As a way to market the marshmallow/peanut butter sandwich idea — and appeal to more people — an advertising agency coined the term “Fluffernutter." ​​Archibald Query of Somerville, Massachusetts, invented a sweet, marshmallow-like spread that he named Marshmallow Creme. Go nuts with your fluffernutter creations. Although Fluff with peanut butter is the OG of fluffernutters, there’s no rule saying you can’t get creative — so experiment with new combinations. For a more savory take, try adding bacon. To add a bit of tang, spread on some jam. If you want to create the ultimate sweet treat, try adding bananas, chocolate chips, or Nutella. While it may be tempting to keep the gooey goodness of a fluffernutter to yourself, remember: there’s plenty of Fluff to go around. So on National Fluffernutter Day, celebrate by spreading the love by making extras for your coworkers and friends. If you have kids, bake fluffernutter-inspired cupcakes or cookies for them to bring to school and share with classmates and teachers. Share the goodness on social media. Whatever fluffernutter creations you choose to consume, share your tasty treats on social media. Snap a pic, take a Boomerang, capture the deliciousness on a video — however you choose to post about your National Fluffernutter Day treat, just be sure to use #FluffernutterDay when posting. ​Former International Space Station commander Sunita Willimas requested to have containers of Fluff on her 322-day journey to space. ​Celebrated every September, the “What the Fluff?” festival takes place in Fluff’s hometown of Somerville, Massachusetts, and draws approximately 10,000 visitors every year. ​Fluff has yet to change its recipe: corn syrup, dried egg whites, sugar and vanilla. ​Half of all Fluff profits (through selling 7 million pounds annually) comes from New England and upstate New York. Paul Revere’s great-great-great grandchildren created Snowflake Marshmallow creme and started selling “Liberty Sandwiches"— consisting of creme and peanut butter, during World War I. Of course kids love National Fluffernutter Day, but it's also an opportunity for adults to feel like a kid again. Although people of all ages can eat fluffernutters any day of the year, chances are most adults don’t — so National Fluffenutter Day is the perfect opportunity for them to indulge on a treat they most likely haven’t had in a long time. Whether or not you love cooking, National Fluffernutter Day is an automatic night off. So relax, because you’ll have all this extra time to do whatever you want — like savor every last bite of a fluffernutter. To save even more time, shop for your fluffernutter ingredients the day before National Fluffernutter Day.